What are Some Good Carp Waters in Ohio? Interests:Fishing, hunting, guns/target shooting, video games, reptiles, tarantulas, and video editing. So I'm going to go visit my friend in Ohio and he's never been fishing and he wants to go carp fishing with me. I've never been to Ohio but I have looked around on google earth at some potential carp waters but have no idea how good they are. I'm looking for a nice place to take a first time angler so the area can't be too challenging of a water but ideally it should still have some decent sized fish in it. Can anybody recommend any good carp fishing waters in Ohio? Thanks! Ohio is a pretty big state. Where will you be staying? City? 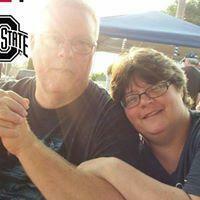 I will be staying at Smithville Ohio. I guess the next question is, how far are you willing to drive? Lakes I have fished are little ways away. Not familiar with carping waters as I haven't lived in Ohio for many years. Should be some good carping just about anywhere. Get a map and start looking. While there, check out the Amish community. Holmes County has one of the largest populations of Amish in the country. Off topic but interesting trivia. Back in the early 50s, Smithville was known for their speed trap. They cut you no slack whatsoever. If you were clocked at one MPH over the posted limit, you were given a ticket. The town saved up the money from the fines and used it to build a new high school. I'll drive 45 min but I'll drive an hour or more if it's like amazing. So far I got Nimisila Reservoir, North Reservoir (Portage Lakes) on my mind. But if we just catch a bunch of dink carp there because it's overpopulated with them I'd like to have a backup plan to maybe catch a +20 lb carp. It gets fished fairly often, but a place for big Commons and Grassers (I've seen one at 57lbs) is Wingfoot Lake. It's 45 minutes away. Ok thanks! I'll check it out. 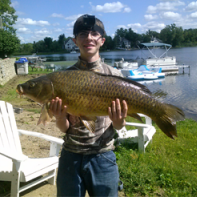 Was that 57 pound carp you saw a common or a grass, and do you know if was it killed or not? It was a Grass carp. I've seen Commons over 20+ as well. All these fish were caught by carp anglers and released safely. Charles Mill about 25 miles away from you has a lot of carp between10-20# with some to 25#. Good access as well. I've never fished in Ohio, but I do know that Lake Erie produces some of the largest carp in North America, some fish topping 40 pounds on a regular basis. If you're willing to drive an hour to get there, there is a fishing area on the lake on East 72nd street in Cleveland, and a pier called Edgewater pier, also in Cleveland. Again I'm from out of state so take what I say with a grain of salt, but I would put my money on Lake Erie. The fish will move in to the shallows during the next few weeks making them accessible from shore. When will you be in Ohio? We are having a fish-in this weekend up at Lake Erie. I was planning on going the 27th. Let me know how the fish in goes and post some pictures.